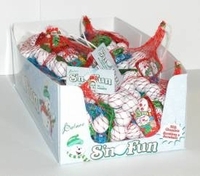 This mixture of Christmas candy is "Sno Fun " Each mesh bag had milk chocolate snowmen and snowballs. You get approx 5 snowmen and 14 snowballs for a total of 19 pieces of Christmas candy. These are not only a perfect stocking stuffer but a great gift from St. Nick.